Green_8_12_x_8_12_Square_Envelopes is rated 5.0 out of 5 by 1. Can I get a sample of this envelope? Here is our sample policy: http://www.jampaper.com/Product-Samples.asp, yes you can definitely get a sample. 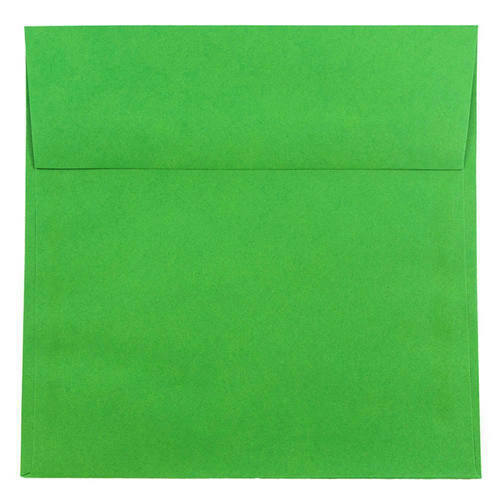 Get all your mailing needs squared away with these large Green Square Envelopes. Certainly not lean or mean, these green envelopes are going to leave a happy and lasting impression on anyone fortunate enough to receive one. Green 8 1/2 x 8 1/2 Square Envelopes feature a wide range of all that is green, from the dark side to the light side and even going so far as to touch upon the aqua/teal spectrum. Perfect for all appropriately square sized letters, invitations and other postal content, use these for any squares that need a larger than average envelope, and a square that stands out from all of those rectangles everyone gets in the mail. So go green and keep your guests, potential clients, family and friends happy to get their mail! Green 8.5 x 8.5 Square Envelopes are available in 5 different colors: Green Brite Hue (with 30% recycled content), Olive, Teal, Racing Green Translucent and Aqua Translucent.